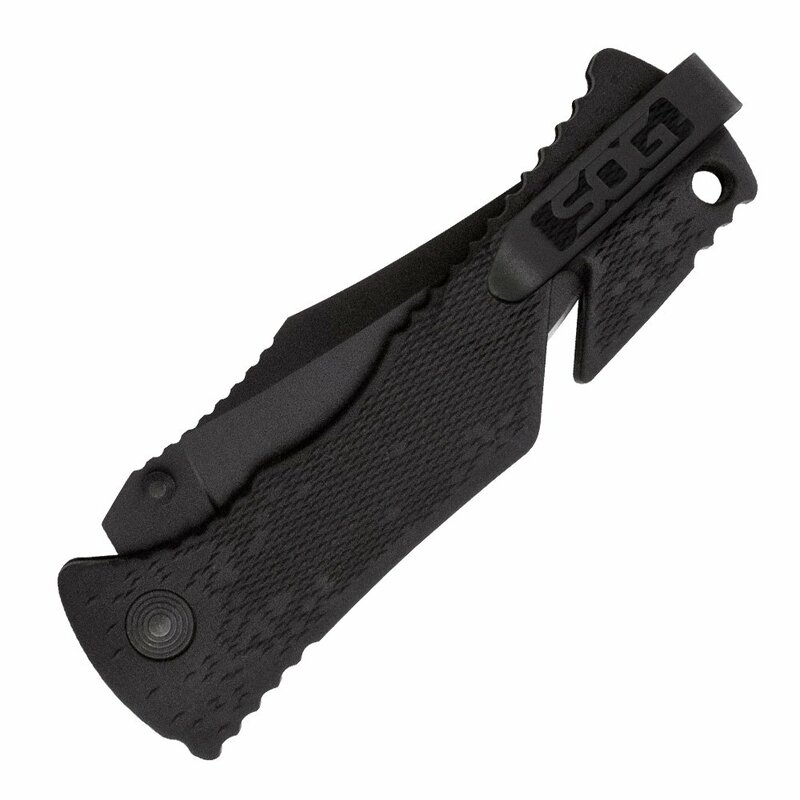 The blade on the SOG Specialty Knives Trident Assisted Folding Knife TF1-CP is partially serrated, made from AUS-8 steel and measuring 3.75 inches in length. The blade features a clip point shape and has been given a black TiNi finish that not only promotes the durability and long life of the blade but makes it ultra stylish as well. Simple to open with safety and ease in mind, this knife is easy to handle. High-tension coil springs send the blade open in a snap. The strong, reliable locking mechanism of this knife means that you won’t have to worry about it slipping closed, even when using it for tough applications. The blade on the knife is held in position using a trustworthy piston lock which can be released at will using the sliding button. A final layer of safety is added when the blade is closed shut, and the lock switch will display a red color when the knife is ready to open up. 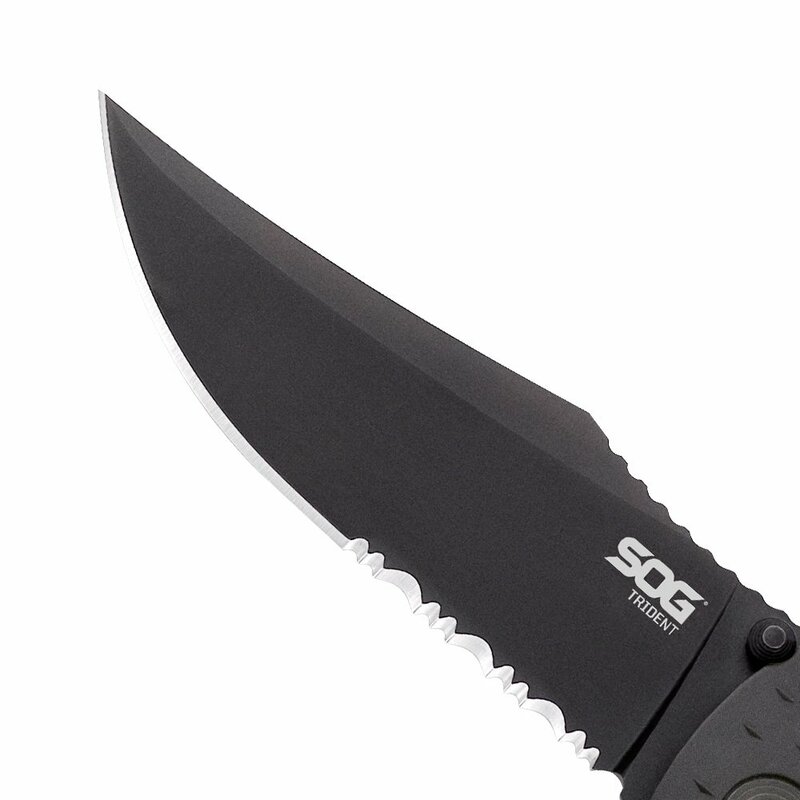 The SOG Specialty Knives Trident Assisted Folding Knife TF1-CP features a blade that has undergone the Cryogenic Heat Treatment process, a process that is patented by SOG themselves. This process promises that the blade will stay sharp use after use. The process of this unique testing takes over 48 hours to complete. It works by reducing the temperature of the blade to less than an impressive -300 degrees Fahrenheit. After this has been completed, the blade is then gradually heated back up to room temperature. The stress that this process generates helps to strengthen the steel at the most basic level–the atomic level. No matter how sharp, durable and long lasting that the blade is, performing efficient work is difficult if you cannot get a comfortable grip on the knife. 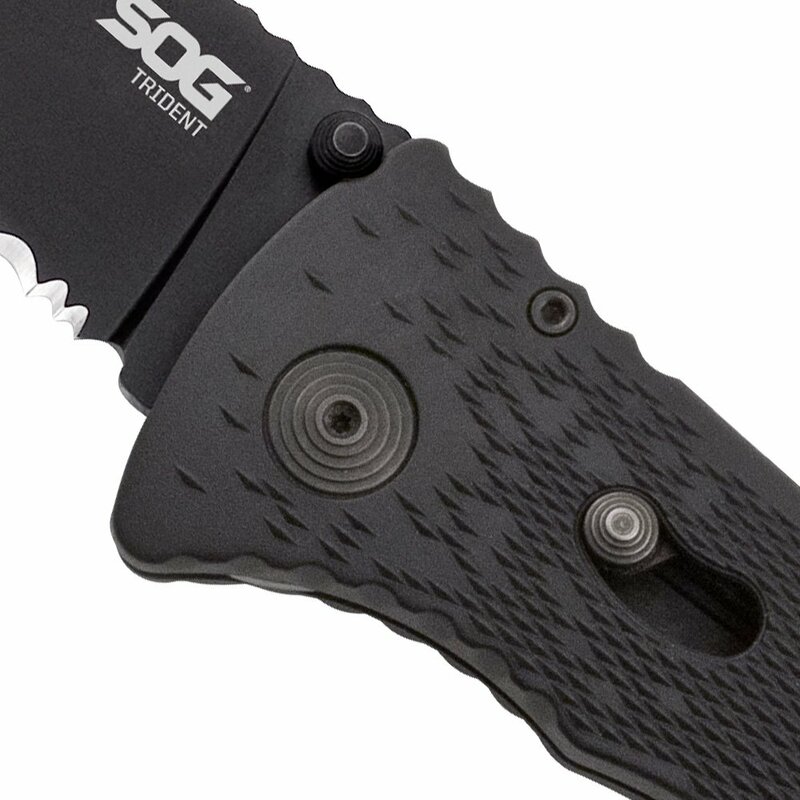 The SOG Specialty Knives Trident Assisted Folding Knife TF1-CP solves that issue before it begins with an ergonomic, contoured handle. 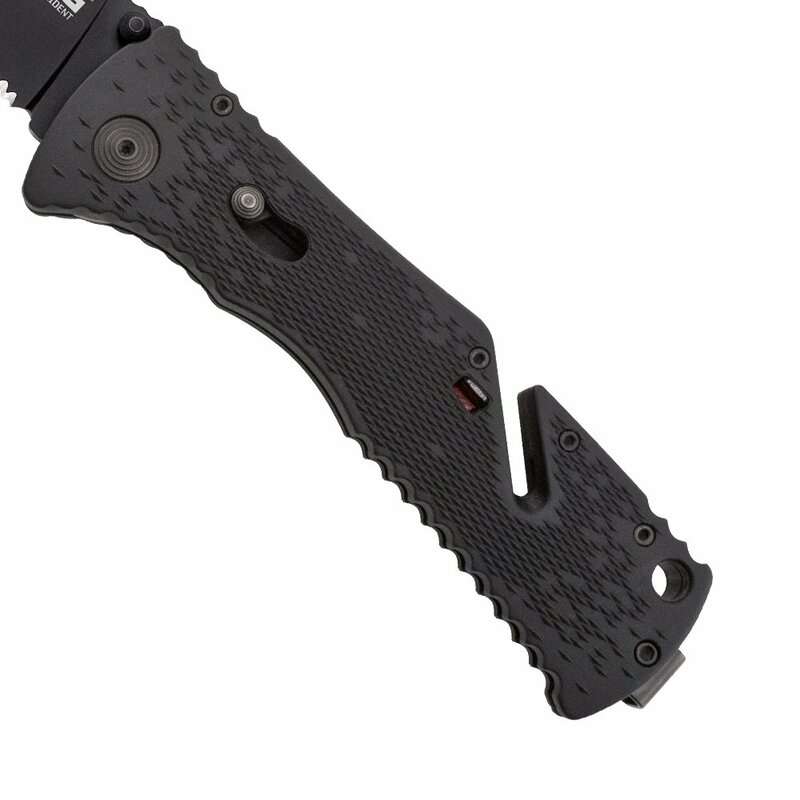 Made from ultra robust glass reinforced Zytel, the handle features Digi-Grip texturing that is unique only to SOG. This feature gives you immense, dependable gripping power. On the handle is a grooved notch that allows you to cut cable and heavy cord alike with ease and without having to open the blade itself. Weighing only 3.6 ounces, this incredible folding knife is simple to carry with its ultra lightweight nature. A bayonet-mounted and reversible clip sits on the back of the handle which makes it simple for sitting in the perfect spot in your pocket. The clip can be removed in order to accommodate both left- and right-handed people alike.